Review Essay on Frank P. Harvey. Explaining the Iraq War: Counterfactual Theory, Logic and Evidence. Cambridge University Press, 2011. ISBN: 9781107014725 (hardback, $99.00); 9781107676589 (paperback, $29.99). Counterfactual argumentation usually takes the form of counter-narratives. Scholars use minimal rewrites of history to change a feature of the past (the antecedent) and build a chain of logic consistent with the available evidence to a different outcome (the consequent). This method is most appropriate to arguments for the contingency of events and the feasibility or likelihood of different outcomes arising from changes – perhaps even small changes — in context. Harvey is making the opposite case: for overdetermination. Even large changes, in this instance a different president, would not have made much of a difference. A variety of antecedents would likely converge on the same consequent: an American invasion of Iraq with the goal of removing Saddam Hussein from power. To sustain this claim, Harvey makes a list of twenty conditions or features of context that were critical to the Bush administration’s desire and ability to go to war in March 2003. He asks how many of these would have been present in a Gore administration and finds evidence for almost all of them. Harvey recognizes that the decision for war was not an either-or option from the outset, but the product of a chain of events that unfolded between the outset of the administration and March 2003. He argues that international context would have been fundamentally the same for Gore as it was for Bush: international support for inspections, Saddam’s refusal to permit meaningful inspection, intelligence warning that he had, or was about to possess, weapons of mass destruction, and domestic pressures not to take security threats lightly in the aftermath of 9/11. Once Gore started down this road, pressures would have built on him to continue down it, and by the time the point of no return was reached, he would, more likely than not, have opted for war. Harvey is right to choose the counterfactual strategy he does for the kind of claim he makes and wise to consider the importance of pathways and the way they influence calculations of leaders who go down them. And there can be little doubt that Gore and Lieberman would have gone down this pathway, as they were among the most hawkish Democrats in the Senate and on record in support of the Bush administration’s policy toward Iraq. I will return to the question of whether President Gore would actually have committed force to remove Saddam, which, I believe, involves other considerations as well. 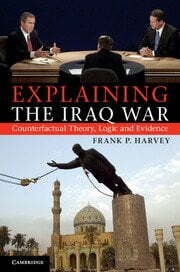 The substantive value of Harvey’s study lies in its challenge to the conventional wisdom about the causes of the 2003 Iraq War. The dominant interpretation holds the neo-cons in the administration responsible, although this hypothesis comes in strong and weak variants. Many of its advocates offer the counterfactual that Gore would never have invaded Iraq. Their counterfactual assertions make Harvey’s turn to them a rhetorical as well as methodological necessity. In contrast to Harvey’s carefully elaborated counterfactual arguments, advocates of the “Gore-no war” thesis never actually make arguments; they state their counterfactual claim as if it were self-evident. Convention wisdom should always be challenged because the truth is never easily, if ever, established. Of equal importance, any consensus on a politically important question like the origins of the Iraq War should make us very wary. More often than not it is the result of a tacit conspiracy to avoid addressing, let alone coming to terms with, unsettling political realities. Examples include the belief encouraged after World War I by political leaders in power at the outset that it was unavoidable, the Italian claim to have been brava gente during World War II, that belief by Kennedy administration officials and scholars that Khrushchev attempted to deploy missiles secretly in Cuba because he doubted Kennedy’s resolve. With respect to Iraq, Democrats and anti-Bush Republicans alike have strong political incentives to pin the tail of Iraq on the neo-con donkey. It is important to challenge this convenient scapegoating. Harvey is right to do so, and should be applauded even by those who do not fully accept his argument about Gore. My initial response to Harvey’s argument was to scoff, but this was before reading the book. I do not subscribe to the neo-con argument, and have made what I believe to be a more nuanced one in which I attributed the invasion to the combination of a particular American mindset and public mood, diverse agendas of top officials in the Bush administration, and the President’s personality. In the course of reading Harvey’s account I had to acknowledge that there are general American and administration specific reasons for the invasion of Iraq and that I may have exaggerated the latter. Elsewhere, I make the case for considerable continuity between the Bush and Clinton administrations, and almost four years of the Obama presidency extends this continuity into a third administration. Perhaps there is more continuity in American foreign policy than I want to admit because to do so would suggest that the challenge of reorienting that policy is even greater than I supposed. After reading Harvey, I have shifted my position, but I do not sign off on his conclusion. For a number of reasons I think the Iraq response of a Gore administration is still an open question. The first of these reasons is Afghanistan, the invasion of which is barely touched on by Harvey. Would a Gore administration have “hijacked” 9/11 the way Bush did? Might they have pursued a different strategy for going after Osama bin-Laden and reducing the threat posed by Al-Qaeda? Without an Afghan invasion, or with and invasion and the successful elimination of Osama, the context of Iraq changes. Second, I would not take at face value the statements of public officials. What political figures and their advisors say what they would do and what they would actually do are often not the same. This can be true even when these officials say what they mean. At the March 1987 Hawk’s Cay Conference on the Cuban Missile Crisis, President Kennedy’s Secretary of the Treasury C. Douglas Dillon made a revealing admission. He acknowledged that he had been a hawk during the crisis and consistently urged Kennedy to authorize an air strike against the missile sites. He thought he was being a responsible advisor for representing this position forcefully. Had he been President, he was not sure that he would have followed this advice; his perspective and responsibilities would have been different. Third, I would offer a more nuanced treatment of the domestic political context. It is not convincing to cite public opinion polls and statements by politicians as evidence that a Gore administration would have faced the same pressures to attack Iraq. Much of the public concern for Iraq was a product of the nearly constant efforts by administration officials to focus public opinion on the issue, and to do so by making a series of unsubstantiated claims about Saddam’s WMD and putative support for Al-Qaeda. As for key Democrats, at least some of them, I suspect, felt enough pressure and were insufficiently courageous to oppose an event that appeared almost certain to happen. Harvey should have resorted to another counterfactual here: an analysis of what public opinion might have looked like in the absence of the full court press of the Bush administration to equate Saddam with Hitler and mobilize public support for war. My readings of the polls suggest that it would have been below 40 percent, as it was on the eve of the administration’s media blitz. When war finally came support was at 80 percent, although it soon began a steady and irreversible decline. Fourth, I would be careful of citing estimates by foreign intelligence agencies evidence that they made similar assessments to those of the CIA. In most cases, these estimates were based on, or at least influenced by, intelligence provided by the U.S. Finally, I think Harvey focuses too narrowly on the neo-cons. They are certainly not a straw man hypothesis as so many journalists and scholars hold them responsible for the invasion. However, he could have made a stronger case for his structural explanation if he also attempted to counter more nuanced arguments that attribute the war not just to the neo-cons but to a combination of other attributes of the Bush administration and its officials. These concerns and criticisms in no way detract from my favorable assessment of this book. Against the grain arguments of this kind – and especially when they are done so well – are critical to keeping our minds open and our analysis focused on the right questions. Richard Ned Lebow is Professor of International Political Theory in the War Studies Department of King’s College London and Bye-Fellow of Pembroke College, University of Cambridge. He is also James O. Freedman Presidential Professor Emeritus at Dartmouth College. His most recent book is The Politics and Ethics of Identity: In Search of Ourselves (Cambridge University Press, 2012). Richard Ned Lebow, Forbidden Fruit: Counterfactuals and International Relations (Princeton: Princeton University Press, 2010). Richard Ned Lebow, A Cultural Theory of International Relations (Cambridge: Cambridge University Press, 2008), ch. 8. Richard Ned Lebow and Michael Fitzgerald. “The Bush Administration and Iraq: The Mother of all Intelligence Failures,” Intelligence and National Security, 22 no. 5 (2006), pp. 884-909. Richard Ned Lebow, Why Nations Fight: The Past and Future of War (Cambridge: Cambridge University Press, 2011), ch. 1 for opinion polls before, during and immediately after the administration’s public relations blitz.